"...there is no such thing as 'hard' climbing or 'easy' climbing - more of this needs to be understood. 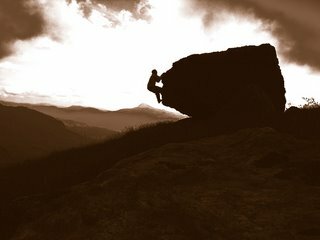 99 percent of us end up being just climbers, not 'Rock Gods', but really we haven't stopped doing the same things. When we give up the idea of competition and start motivating ourselves with our own goals rather than others' expectations, it becomes apparent nobody was watching all that time... your belayer is most likely thinking about dinner, a warmer duvet jacket or the next lead... whether you've just cranked out an E8 headpoint or topped out on a gripping V Diff, as long as the motivation has been rekindled, that's all that matters. Climbing on your own, solo, or just bouldering alone is a great way to source the real elemental stuff - it reminds you of your own limits, the boundaries you've set up. It is just movement on rock, moving through our own internal maps and renegotiating these boundaries - the only one you can't bribe is yourself! Also, too much concentration on training can be a bad thing, make the effort to get out on the real stuff despite the weather. Again, go exploring. Climbing is a holistic experience: friends, geology, the route, weather, situation, history... you can rely on other elements while your motivation wavers: help a friend on a route, go out with someone new to climbing, go exploring, learn about geology, read some history, absorb other elements and don't expect to be the best climber on the planet... there is no such person." Lee Robinson has been busy with friends at Carn Liath, mapping the jungle of boulders for a future guide. It has a full circuit now and some hard projects, well worth stopping at if you're anywhere near Portree - it gets the morning light and the rock is a lot kinder on your skin than the gabbro. 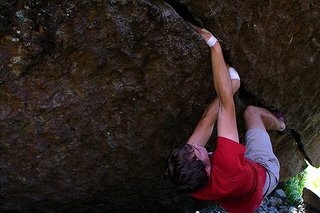 Thanks for the photos, Lee, some absolute cracking problems! Described by first ascensionist James Sutton as a 'deluxe 10 m jamming crack' (since when is jamming deluxe!! 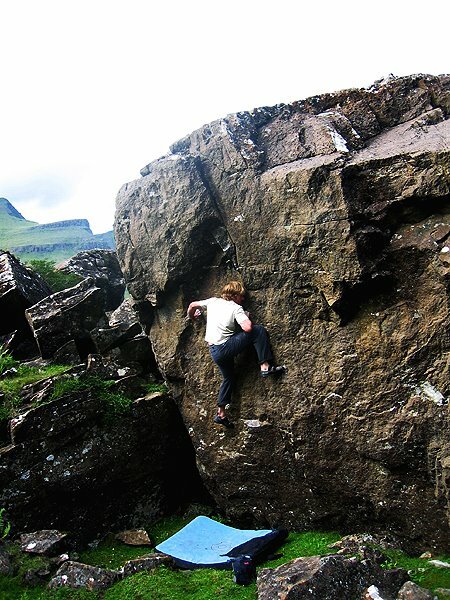 ), this line is probably the most 'climb-me' problem on the Isle of Skye. It is indeed a long jamming crack just above the ground, overhanging severely and requiring grit, single-mindedness and lots of tape. The problem itself is a delight, starting on good jams, but soon becoming demanding and technical in how you sequence your jams and how best to hook your toes... with persistence it all comes together and you might find yourself at the final brutal pull through the nose - if you are canny enough and determined enough! Remember, pain is just weakness leaving the body! 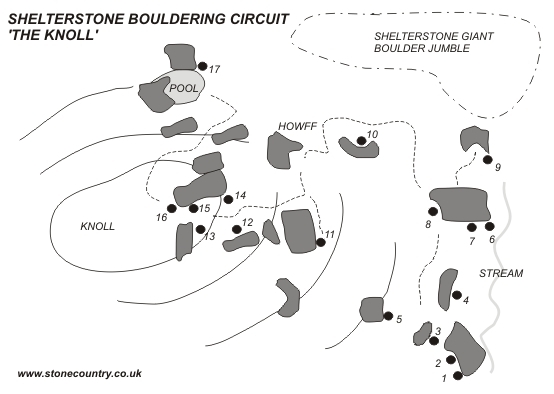 This topo is a rough guide to good safe problems up to about V3 on the Knoll boulders underneath the Shelterstone. Please let me know of any other problems you might do or know of that are worthy, or any harder problems that have been done above about British 6a. Lots of problems have been done here and it would be good to get a consensus of the best circuit and best 'off-piste' lines, some of which lurk in the great jumble above the Knoll. 1. Easy arete on reddish granite. 2. Overhanging groove, moving left on higher jugs. 4. Bigger slab to the right, straight up. 5. 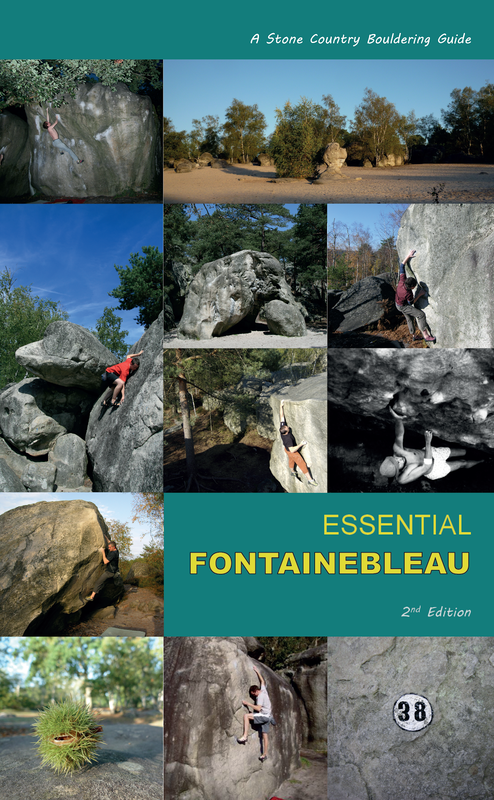 Cube-shape boulder arete. Jump to start. 6. 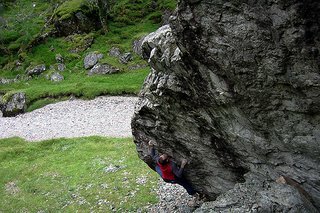 Right arete of the diagonal crack boulder. 7. Tiptoe r-l along the diagonal crack then reach high for jugs in centre of wall. 9. Right side of sharp arete. 10. Lip traverse l-r of curved boulder. 11. Easy large slab left to right arete above small howff. 12. Short wall on pink crimps. 14. Traverse crack from R-L.
15. The right hand side of the Nose. 16. The left hand side of the Nose. 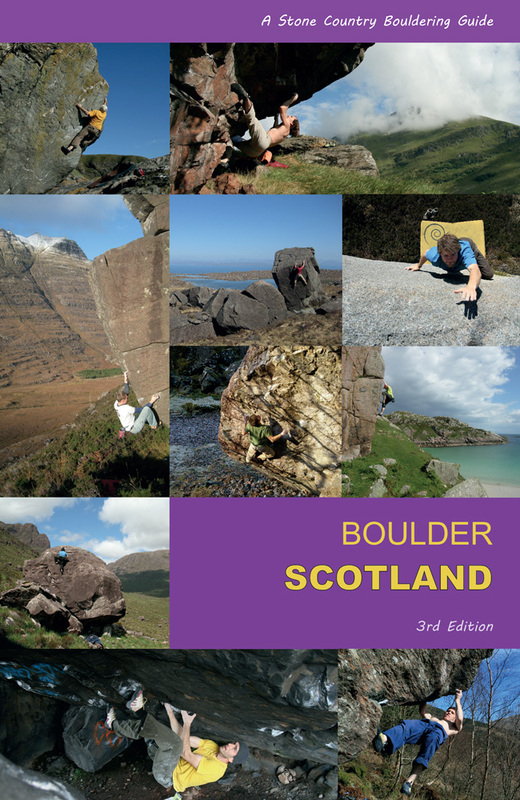 It is inevitable there will be a number of Dumby problems in any Scottish classic bouldering wish-list. As the years go by (and the layers of graffiti paint build up), this testpiece has maintained its notoriety despite the big numbers flying around. 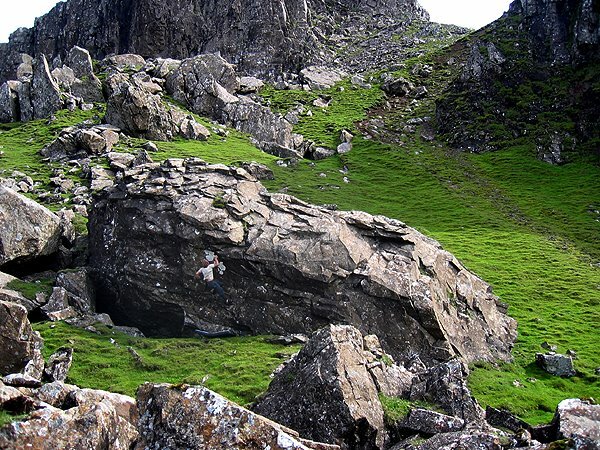 It is a simple enough direct line, rocking up on a polished edge for a frustratingly out-of-reach hand ledge, then boldly finishing up the suddenly bottomless arete on thankfully good holds. It combines technique, strength, balance, commitment and persistence: the trademark of any Dumby problem. Redoing it brought back to me the subtlety of this problem. Due to its disproportionate polish (Dumby is after all famous for its polished slopers! 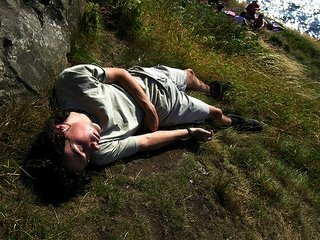 ), the crucial rockover edge requires a steady toe and a focused eye. The press with the left fingers on a good incut keeps the balance until the slimy pinch hold for the right hand comes into play. This hold is notorious for popping like a soap-bar and you slowly feel the tug of gravity, often snapping like a crab at the vanishing hold. If it sticks, it allows the pressure to be placed on the toe, the leg extends, the press becomes a full-tension counterbalance - glance once at the rail (otherwise your head tilts you off-balance) and slap for it in as controlled a manner as you can with the right hand. Alternatively, fall into a lower-down edge and cross through to the good rail, though this feels more committing. ...the cigar can't be lit unless you finish up the arete. This is Dumby after all, and sometimes a good problem is supposed to give you a flutter! Okay, this is entirely subjective, but please make any comments and a consensus may develop (some hope!). 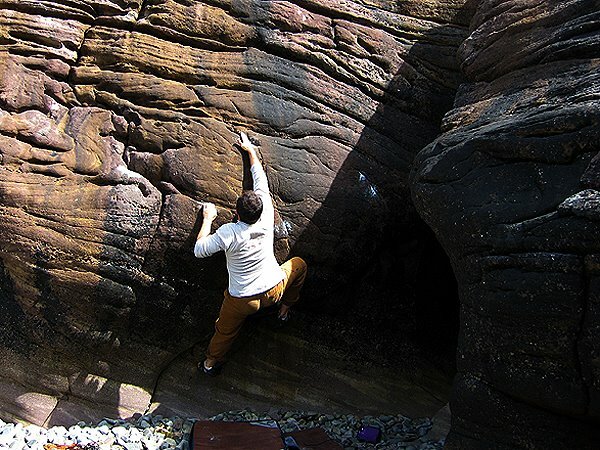 I'll be posting candidates for Scotland's select 100 problems, with a film in mind... here's my first candidate: the Ardmair pocket problem Stones & Seaweed ss V2 6a. First of all, I believe a good problem is one you remember long after you do it, one you will no doubt return to. In fact, any problem you really enjoy. It usually exhibits a natural line (though not always, it can be blank or an eliminate); it has enjoyable or unexpected movement (it demands 'solving'); the rock and holds are attractive or curious; it requires balance, power and subtlety in one; other people mention it in passing... there are lots of crtieria for a good problem, but these are my favourites, what are your's? From a sit start at large smooth undercuts, a difficult smearing test allows a crank to a scooped pocket, which leaves you staring point-blank at the sidepulls you want your right hand on, only you find you can't let go of the undercut... a deft manoeuvre with the left foot allows a counterbalance to snap the just-good-enough sloping edges and a reach up to a right-hand hold (which is not as deep as you might first expect). A final grunt over the bulge and the rest is easy... a delightful little problem, not long, but uses the Torridonian sandstone's best features - slopers, pockets and rounded edges. Echoes of Font. 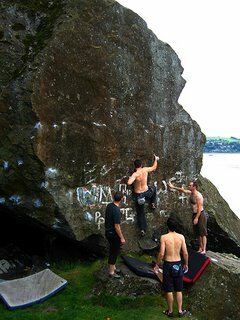 I'll post up some bouldering shots as well soon, new boulders, new areas.